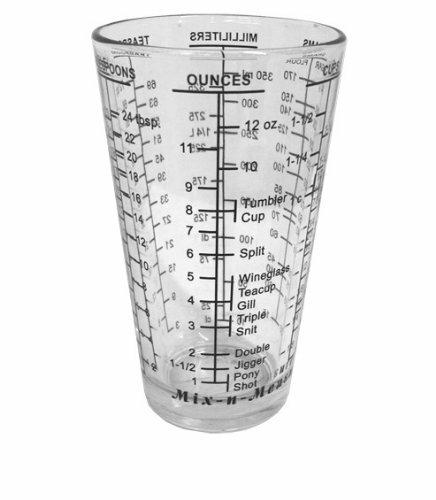 Multi-Purpose Mix 'n Measure is great for the home, lawn, garden, kitchen, bar, or anywhere. The 16 ounce glass is dishwasher safe with permanent markings of teaspoons, tablespoons, ounces and milliliters. The heavy base reduces tipping. NOTE: The 16 oz. mark is the last mark after 12 oz. Two cup mix and mixture measuring cup. Mix and measure glass cup with 5 types of dimensions. 16 ounce glass cup.